“Why so many good sisters?" Pierce Butler, 1866-1939. Associate Justice, United States Supreme Court, 1923-1939. Autograph Note Signed, Butler, one page, 4" x 5½", on memorandum stationery of the Supreme Court of the United States, no place [Washington, D.C.], no date [1930s]. This is a rare piece of internal Supreme Court correspondence. 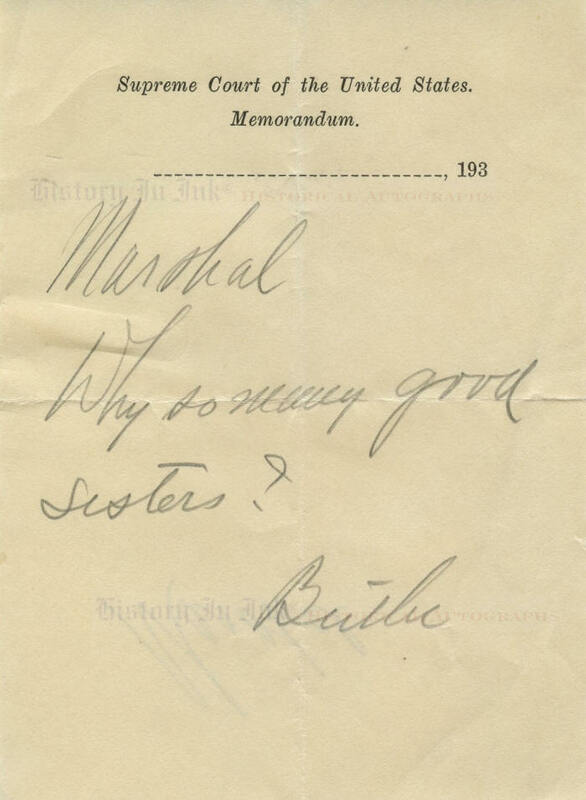 Butler, the first Minnesotan to sit on the Supreme Court, pencils a note to the Supreme Court Marshal to question the number of ladies present in the courtroom. In full: “Marshal / Why so many good sisters?" It seems clear that Butler sent this note to the Marshal during a public session of the Supreme Court, whether during oral argument on a case or during the announcement of decisions. The note has been folded in half, and Butler addressed it to “Marshal" on the back. It is not uncommon for Justices to pass notes among themselves and to others from the bench. Justice John Paul Stevens has noted that the Justices have access to “pages sitting behind the bench on seats that are not visible to most people in the courtroom,” have pads “for notes that a page will deliver to a colleague at the other end of the bench,” and sometimes request pages “to obtain a specific court opinion,” often "previous Supreme Court opinions gathered in the volumes shelved in the area immediately behind curtains that are opened when the justices ascend the bench." John Paul Stevens, Five Chiefs 117 (2011). It would have been equally easy for Butler to have sent this note to the Marshal by a page. Although he was a Democrat, Butler was appointed by a Republican, President Warren G. Harding. As a Justice, he did little to disappoint economic conservatives. He joined with Justices James C. McReynolds, George Sutherland, and Willis Van Devanter, the “Four Horsemen,” in staunch opposition to much of President Franklin D. Roosevelt's New Deal social legislation. The Supreme Court's hostility to New Deal measures led Roosevelt to propose his controversial Court-packing plan in 1937. Yet Butler showed signs of liberalism as well. For example, in Buck v. Bell, 274 U.S. 200 (1927), Butler was alone in dissent from the Court's opinion, written by Justice Oliver Wendell Holmes, Jr., holding that Virginia could involuntarily sterilize a third-generation “feeble minded" woman. “Three generations of imbeciles,” Holmes had written, “are enough." In Palko v. Connecticut, 302 U.S. 319 (1937), Butler was again the lone dissenter from the ruling that the Fourteenth Amendment did not bar the state from trying a criminal defendant a second time for the same crime, obtaining a conviction and death sentence for first degree murder, after obtaining a reversal of his second-degree murder conviction. Palko was later overruled in 1969. Unfortunately, Butler did not write an opinion expressing the reasons for his dissent in either case. Butler's appointment was controversial. He was supported by Chief Justice and former President William Howard Taft and by railroads, the Minnesota Bar Association, and prominent Roman Catholics. He drew opposition, however, from the likes of Minnesota Senator-elect Henrik Shipstead, Wisconsin progressive Senator Robert M. LaFollette, Jr., and liberal newspapers such as The New Republic and The Nation. In the end, however, the United States Senate confirmed him by a wide margin, 61-8. This note is in fine condition.  It has horizontal and vertical folds, a paper clip impression at left, and an archivally repaired ⅜" fold split on the right edge. Butler's writing and signature are dark. Provenance: This note comes from the personal collection of Justice Tom C. Clark, who served on the Supreme Court from 1949 until 1967. Justice Clark collected the autographs of other Supreme Court Justices dating back into the 19th Century. We are privileged to offer a number of items from the collection. This one comes with the backing page, which bears the federal eagle watermark and Justice Butlerʼs typed name, that Justice Clark inserted behind the item in the page protector used to house this letter his collection. The backing sheet has some unrelated notations written on it. This note is not laid down to the backing sheet.